How do I prevent structured data from being included on a certain recipe? If you use Tasty Recipes to publish non-human-edible "recipes," learn how to prevent structured data from being included. According to Google, recipe markup should be included on human-edible food only. 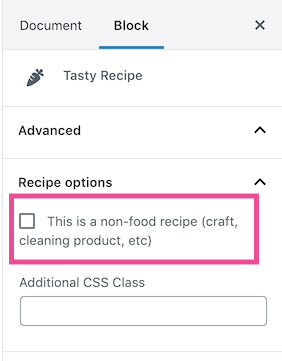 So if you use Tasty Recipes for things such as dog treat recipes, homemade cleaning product recipes, or even craft and sewing projects, those shouldn't include recipe structured data. In the Block (Gutenberg) Editor, disabling the structured data is a simple checkbox. With the recipe block selected, click on the Advanced tab in the block sidebar. You'll see a "Recipe Options" area that includes the box for disabling the structured data for a non-food recipe. In the Classic Editor, you can add the a disable-json-ld flag to the recipe shortcode in the post editor to prevent structured data from being written to the page. You'll be able to edit the shortcode in the Text view of your WordPress post.